So, this episode started with Kurisu confessing the handle she used on @ch when talking to John Titor. I guess hearing the part-timer's story made me start to question the plot a bit. If SERN had created the time machine, how did the part-timer time travel without them knowing? You would think that that would be the first thing you would monitor, in the case of someone altering time to usurp your power. 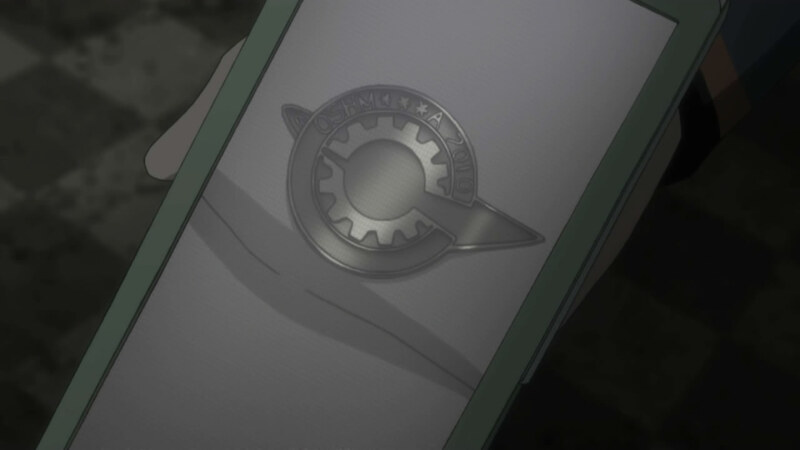 It is portrayed that they already had the ability to monitor it in 2010, since they caught the first message that Ookarin sent. There's some slight inconsistency here. 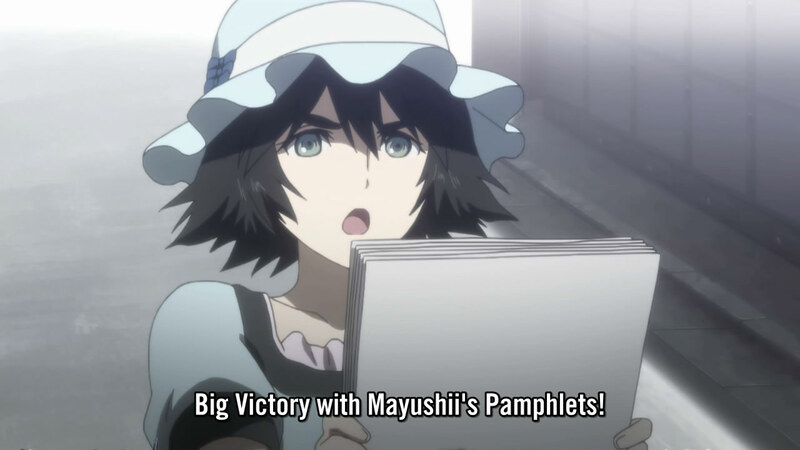 I actually didn't connect these dots, but someone else pointed out that Daru could be the part-timer's father. It would make sense, since they were the only other independent group working on a time machine other than SERN. It also explains why he found it so easy to fix the time machine. It's rare that I miss a catch like this; I think I'll blame the fact that I've been tired lately...and, also, Godzilla was attacking while I was watching this episode, being quite distracting. I don't know why they don't fix it; it would be pretty simple. Create a second casing inside of the spinning piece so that it is two separate pieces, thus the spinning won't affect the camera. The two pieces could be connected by ball bearings or something of that sort; it's just so easy peasy, and they call themselves scientists... 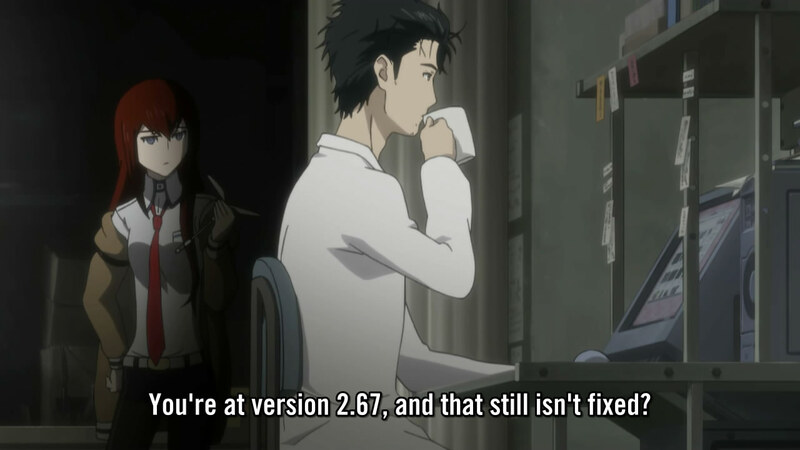 Either way, I would randomly name versions, too; how often would it affect anyone but the developer? So far, all the future gadgets seem pretty worthless. They're not even worthy of the description "future gadget". So, I guess the question is, "Where will they go from here?" 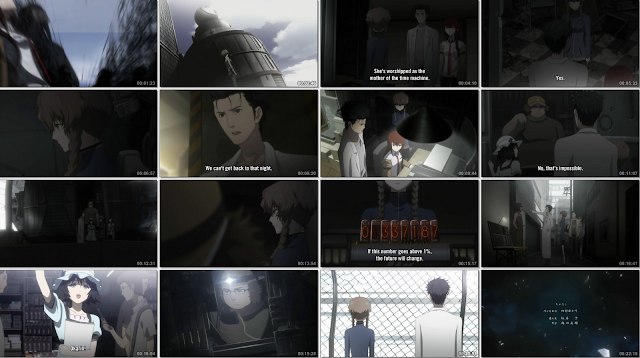 This episode seems to have calmed back down now that they have more time. What hasn't been explained is why more people can't travel in that pod; it looked big enough to hold more people. 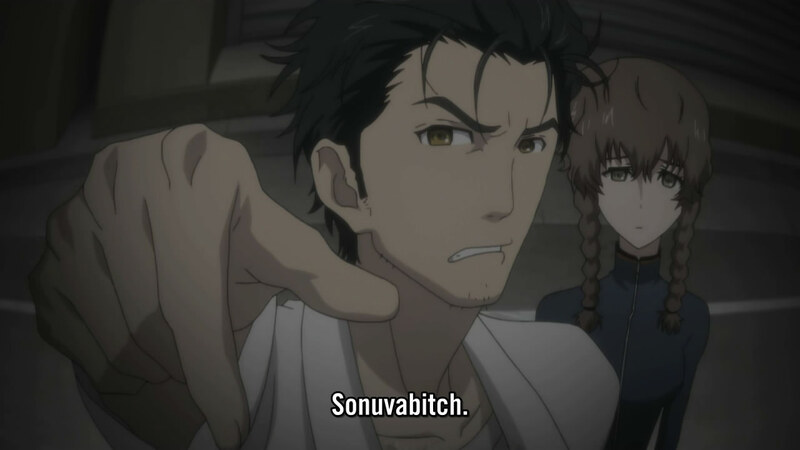 I guess the black guy will give them some clue that will eventually lead back to Daru, but we will see. This is all speculation. 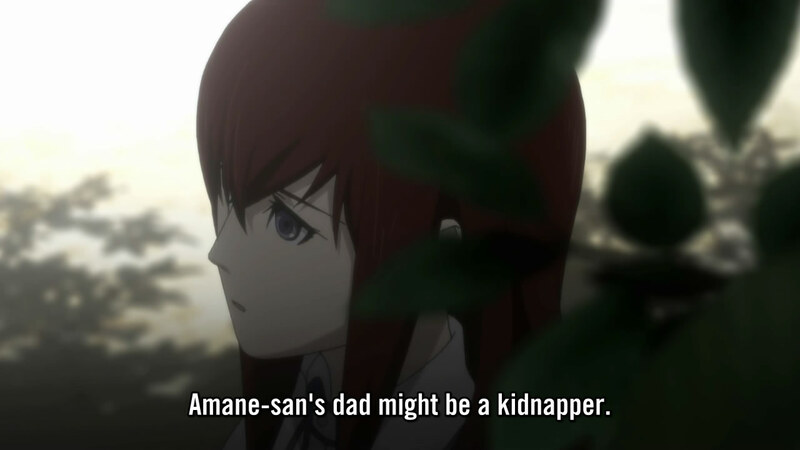 I am still wondering how Kurisu's death in the first episode is connected. 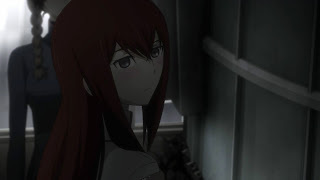 Also, the fact that the divergence hasn't reached a high enough number implies that Kurisu will still join SERN at one point to help them; the question is how that fits into everything, too.